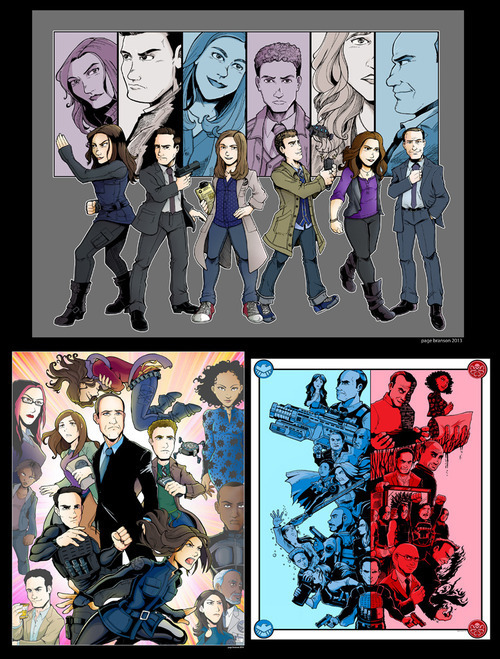 2nd Signed Agents of SHIELD Poster Giveaway! * One Agents of S.H.I.E.L.D. mini poster signed by Clark Gregg. 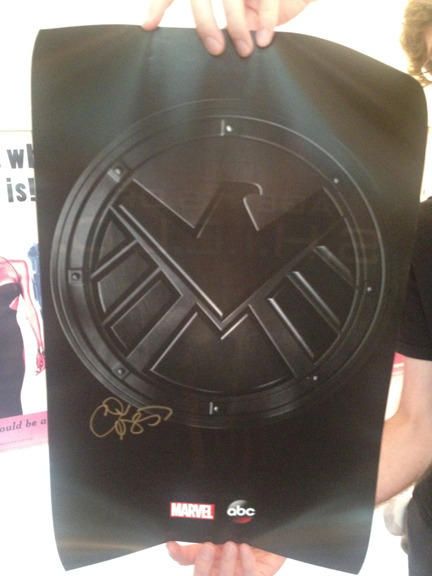 * Optional prize to be included with the signed poster- One of your choice of FOUR 11 x14 Agents of S.H.I.E.L.D. prints from me. Even the forces of Hydra care about people who help our furry friends. Maximiliano Hernandez (Agent Sitwell) and Holly Landfield have started an IndieGoGo project benefiting Earth Angels Canine Rescue. The founder of the animal rescue program, Emelinda Narvaez, has fallen on hard times and is now in need of the same help she has extended to over 10,000 canine companions. Pledges of $10 to $20 will receive a signed Sitwell photo. Pledges of $21 to $50 will receive TWO signed Sitwell photos & a personalized “Hail Hydra” message for their voice mail. J.D. and Page check in after watching (and loving) Guardians of the Galaxy! They also go over some news coming out of San Diego Comic Con as it relates to both Agents of SHIELD and Agent Carter. Warning: Spoilers for Guardians of the Galaxy start at 43:33 in the podcast and run to 01:01:40. Here’s a news/interview rundown of everything Agents of S.H.I.E.L.D. and Agent Carter that might have fallen through the cracks during last weekend’s San Diego Comic Con. Due to the lack of Agent of SHIELDness, J.D. and Page sit down and discuss what they’ve been doing with their summer. They review a few movies, anime, and games that have had their attention, and they discuss the sneak preview of Guardians of the Galaxy. Warning: Spoilers abound for Transformers: Age of Extinction, Godzilla, X-Men: Days of Future Past, Edge of Tomorrow, Maleficent, and How to Train Your Dragon 2. This week, J.D. and Page sit down with Ann Foley, lead costume designer for Agents of SHIELD! They talk about the differences between designing for movies and designing for television, her process for designing for new characters, and some of her favorite moments from season one! You can follow Ann on Twitter @afoley24! Clark Gregg has been all over creation recently to promote the theatrical release of his new movie Trust Me, out in select theaters on June 6th. Most of the interviews he’s done have revolved around Trust Me, but many of them also touch on season one of Agents of S.H.I.E.L.D. Phil Leirness from the Chillpak Hollywood Hour Podcast joins Page and J.D. to discuss everything there is to discuss about season one! Topics include the pacing of the season overall, the internet flame war over Grant Ward, and speculation on what season two can be! In Part 2 of their recap of the season finale episode, “The Beginning of the End,” Page and J.D. read your letters, discuss some of the mysteries still hanging out there after the episode, and take a moment to thank everyone for their support! It’s part one of a two part season finale wrap-up! Page, J.D., and Devon dig deeply into Episode 22, “The Beginning of the End.” They discuss Garrett’s crazy eyes, what happened to Fitz, and how validating the ending scene was. Tears were shed, laughs were had, and we hope you have them with us!